The team of Raell Padamsee organized an annual day for the students of Std. III and IV (for whom the team conducts speech and drama sessions during the year) on 16 March, 2019 at 11.00am. The first session was held for Stds III and IV A & B. This was followed by Stds III and IV C & D. at 1.00 p.m. in the Bianchi Hall. The Principal, Head teacher of the primary section, Mrs. Griselda Fernandes, teachers and a few parents were invited for the show. 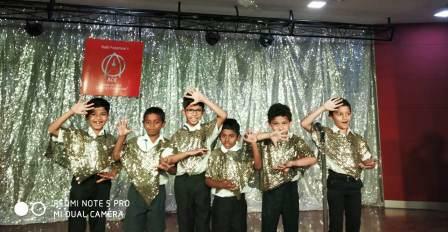 Ms. Koeli , Ms. Swati and the other members of Raell Padamsee team trained the young boys to showcase their talents on the stage. The annual function began with a welcome speech. Students of Std.III and IV staged a variety of items. Imagination development acts, expressions, vocabulary, recitation of poems, improvisation, word of the day, pronunciation and its meanings, proverbs, interpretation etc were a part of the annual day. The little actors acted like real heroes. Each and every student of Std. III and IV got an opportunity to perform on the stage. Each act had its own importance and significance. The team of Raell Padamsee also interacted with the parents giving them a gist of each item. It was well organized and well executed. At the end of the program, the Head teacher thanked the parents for their precious time and also lauded the efforts of the entire Raell Padamsee team for their valuable support and help in the development and growth of our students.